It’s a crisp October morning in East London and nestled away from the busy Brick Lane, Shoreditch City Farm has business as usual. Inside the tepee in the middle of the animal enclosures, Juta Shoes is running their weekly shoe-making workshop. Started as a social enterprise by Joanna Hamer, Juta Shoes encourages unemployed women to learn new skills and learn the ins and outs of working in a business. An alternative route to education for people who don’t have the time to study unpaid, Juta Shoes offers shoe-making skills to the women who sign up, as well as skills in running a business, working in a shop and sales and teaching. It was founded in response to a need in the local community for supported, flexible, well-paid employment. The shoes are beautifully wearable and the leather is sustainable. Using offcuts from local factories, Juta Shoes saves leather from the landfill, literally making treasure out of another man’s trash. The workshop is in the most gorgeous of locations. Always in small groups, the workshop allows for one-to-one teaching meaning everyone is able to create what they had in mind. The shoe design is simple but with enough colours in thread and leather that everyone can come up with original designs and create something unique and filled with character. We caught up with Hafiza, one of the teachers who has benefitted through Juta Shoes to find out about her experience working with them, and how you too can support such a brilliant cause. How did you come across Juta Shoes? I came across a flyer on our local community centre window - St Hilda's in Shoreditch and was interested in attending the training session as I love crafts plus I was eager to start earning money again after being out of employment since having my first child. Were you looking for help when you became a part of the Juta Shoes community? I was looking for employment for a long time but was struggling to find anything that worked for my family, and me or suited the skills I have, I was considering education but that would have been a long-term solution. I think my husband knew I needed help on a personal level and realised straight away that this project is everything that I needed in my life. Now looking back, I was lacking confidence, I was feeling secluded and I needed something in my life that was out of my usual family routine to give me something to look forward to. How has Juta Shoes changed things for you? Since working with Juta Shoes, I've had such a positive change in my life - I felt stuck before, I needed to work but struggled to find anything that would work around my family commitments and I couldn't afford childcare even if I did go back to work. Earning money means I can buy my children and myself nice things without feeling guilty. It's helped my family so much financially, I am emotionally more content which is having a positive impact on my children and the best thing of all is the fact that my children are welcome to come to work with me - it gives me a huge peace of mind and the boys love it too. They love being involved and seeing what I do for work. Through Juta, I also met so many wonderful women who have become my friends and live in the community. Although I lived in Shoreditch for six years, I only knew a handful of people but I wasn't close to anyone. It has really brought me closer to the community and I feel much more involved. What have you learned through working with the project? I've learned so much about ethical/sustainable fashion and found different ways that I could contribute towards helping our world like re-using garments, recycling old clothes, ornaments, books, jewellery and much more, rather than just throwing it away - and it doesn't dent the pocket. It's also really great to see that there are organisations like Juta Shoes who are trying to better the world and lives of women out there with employment barriers, confidence issues and lack of education - being able to work gives you a sense of independence and self-satisfaction, I didn't realise what I had lost when I gave up work, until I started working again, with Juta Shoes. What difference do you hope Juta Shoes can make to other communities and areas? I just wish that more women had the courage to break cultural moulds and push themselves to go out there and work- for their own sake as well as for their children. I grew up watching both my parents work and contribute towards the household, my mum managed to work from home while looking after 8 children and we all got the best upbringing they could afford, I couldn't ask for anything more. I feel so fortunate that Juta Shoes came to my doorstep and was introduced to my life, I'm forever grateful for the opportunity. It is so nice finding a company that is producing high-quality products and making a difference in their community. 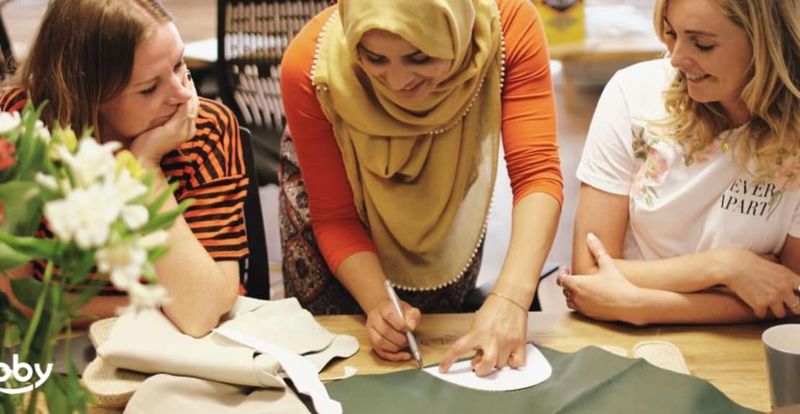 Supporting education and up-skilling is something we are big on at Obby, so it goes without saying we are working closely with Juta Shoes in a partnership to promote their workshops, but you can also buy their shoes on their website, handmade in London by people like Hafiza.